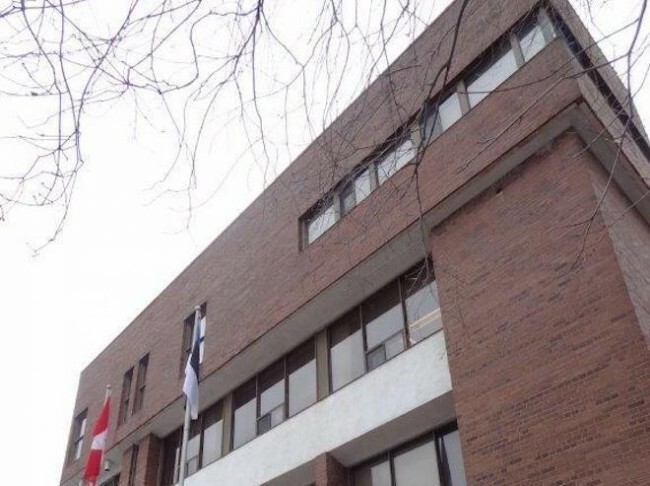 Toronto Estonian House (2013) The Board of Directors of Estonian House commissioned a Property Condition Assessment of 958 Broadview Avenue in November 2018 to provide an up-to-date report on the state of Eesti Maja. The results are broadly consistent with previous analysis relied on by the Board with regard to the cost of maintaining the building, but provide a more detailed view of building systems, including mechanical and electrical systems, and line-item recommendations on repairs. The study was carried out by Pinchin Ltd., a consulting engineering firm specializing in building assessments. The objective was to support due diligence by providing the Board and potential purchasers a current and independent analysis of the building systems – including identifying both immediate priorities and other near-term issues such as systems and components that have reached or are reaching end-of-life. The report covers issues that have arisen or are expected to arise within a 10-year time period. The scope of work included a specialist review of the building’s mechanical and electrical systems. Pinchin was also tasked with recommending further investigative studies that were not included in their scope of work. Pinchin noted several items that may lead to additional costs but could not be verified by visual inspection or without specialist review. The report does not make recommendations on longer-term issues or costs beyond the 10-year time horizon. The scope of work also does not include any evaluation of the functionality of the current building nor does it address any aesthetic or decorative shortcomings. In other words, the study only identifies repairs needed to maintain the building’s core systems and not improvements targeted at improving the revenue-generating potential of the house. The report also does not evaluate the costs or risks of disruption of activities due to unexpected or planned repair work. The study distinguishes between immediate costs, Year 1 costs, and Year 2-10 costs. Year 1 costs are those that are not urgent, but are recommended to be addressed at the earliest opportunity. The study recommends $1.4 M of repairs over 10 years, including $748,500 identified as Year 1 costs. Taking into account HST and Pinchin’s recommended budget allowance of 10-15% for consulting, the cost of the 10-year repairs would be approximately $1.75 M. This is equal to approximately $955,000 in Year 1 and an additional spend rate of $91,000 annually in subsequent years (including HST and consulting). Additional investigations recommended by Pinchin would likely add to these proposed expenditures. Pinchin visited 958 Broadview on November 17, 2017 with four people and examined every room and space that was easily accessible, the roofs, penthouses, the building walls and the parking lot. They also reviewed available onsite documentation. Pinchin was accompanied at the site visit by the Estonian House’s Financial Manager, Tõnu Orav, and a member of the Estonian House Board of Directors, Rein Kuris. They interviewed these individuals and took pictures to include in their report. The final 79-page report makes a total of 24 recommendations for repairs and replacements at 958 Broadview. One area of concern is the roof systems. All of the roofs have been identified by Pinchin as having functionally reached end-of-life based upon their experience and visual inspection of the roofs. The cost of these repairs is estimated as $378,000. Another large cost centre is $549,000 for mechanical and electrical systems. The report mentions that the building has four different heating systems and that there are no building controls to regulate the overall temperatures in the different areas of the building. There are only wall thermostats. Pinchin recommends that the Estonian House investigate this at a future date. This report reinforces the Board’s previous assessments that the cash flow Eesti Maja is generating cannot be expected to keep up with deferred maintenance and maintain a state of good repair. Over 40 percent of every operating dollar the Estonian House would make over the next ten years would have to be invested in maintenance or debt. This is not a responsible plan. Continued investment in the status quo would also divert limited resources, both human and financial, from establishing a long-term solution to our community’s needs. Over the last decade, both community meetings and outside experts have delivered a consistent message – that the status quo is not a sustainable option for our community. Leveraging the value of the land in one form or another is the only realistic option toward developing a long-term, sustainable solution. Debt, grants and piecemeal fundraising alone are far insufficient. Despite considerable turnover in the membership on the Board over the last ten years, the Board’s vision has been consistent in pursuing a long-term community home – following mandates supported by shareholders. The Board is working closely with other organizations in our community to deliver this mandate, through the Estonian Centre project.